Batley prop Alex Rowe on the charge during last Sunday's Heavy Woollen derby victory over Dewsbury Rams. BATLEY BULLDOGS will look to cement sixth place in the Kingstone Press Championship when they welcome bottom side Bradford Bulls to Fox’s Biscuits Stadium for their final home game in the regular season on Sunday. 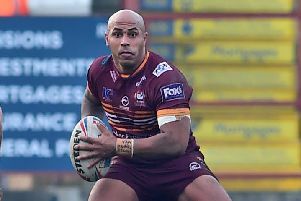 Sixth-placed Batley are two points clear of Sheffield Eagles with two games remaining before they enter the Championship Shield stage of the competition. Bulldogs coach Matt Diskin is aware his side face two tough matches, with a trip to second placed London Broncos to follow on July 23, but believes victory against the Bulls will be enough to confirm a top-six finish. He said: “We have got Bradford at home this week, which is going to be tough because they are fighting for survival and then London away which will be another tough one. “The Bradford game is a big one for us because if we win that should cement the sixth place and we can go into the Shield with momentum. “At the start of the season our goal was the top four but we came short of that. Any points Batley pick up in their remaining two matches will be carried into the Shield when Batley will face four home and three away games as they bid to reach the knock-out stages. The Bulldogs were hit by a virus in the build up to last Sunday’s derby against Dewsbury Rams, which ruled Dave Scott and James Harrison out. Diskin was hoping both would come back into contention to face the Bulls and the medical staff would monitor other players to help prevent the virus spreading in the coming days. Bulldogs fought back from 14-6 down to defeat the Rams 36-20 last Sunday and register a first derby win in four Heavy Woollen matches this season. Danny Cowling is Batley’s other major concern as he is struggling with the after affects of concussion. Bradford have won six games this season, wiping off their 12 point deduction picked up at the start of the campaign, but the Bulls remain 10 points behind second-bottom Swinton Lions and 11 off Oldham, who are just above the relegation zone.